On first intermediary day of Passover, police claim 13 Jews 'breached visit guidelines.' 1,043 visitors on Mount, nearly all tourists. 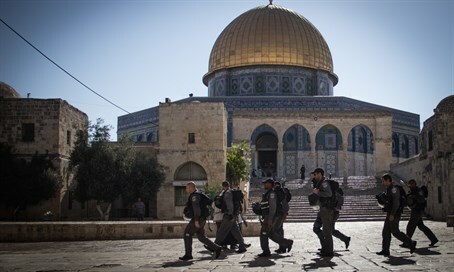 The Jerusalem district police distanced 13 Jews from the Temple Mount on Sunday, the first of the intermediary days of Passover, claiming that they "breached the visit guidelines" on the Mount, the holiest site in Judaism. Despite being liberated in the 1967 Six Day War, the Temple Mount remains under the de facto control of the Jordanian Waqf, which bans Jewish prayer. Israeli police have kowtowed to the Waqf's demands, distancing and arresting Jews for "infractions" that have in the past included merely moving one's lips. Aside from the 13 Jews, one Arab was also distanced from the Mount after disturbing the public order according to the police report. The police noted that over the course of Sunday, 1,043 visitors entered the Temple Mount, and of them 885 were foreign tourists. "The police are prepared with its best forces in the east of the city, at the Western Wall and on the Temple Mount in order to enable all believers, members of the different groups, to realize their freedom of religion," said the Jerusalem district police. "The mission is complicated and it is managed with great sensitivity, but with firmness at the same time." In their statement, the police added that they are investing great efforts during the Passover holiday to maintain public security throughout Israel and in Jerusalem in particular, with thousands of officers deployed in the capital. Earlier on Sunday morning, a Jerusalem court released ‘Return to the Mount’ movement leader Raphael Morris to house arrest, rejecting a police request to keep Morris behind bars until the end of his trial. Morris was arrested on Friday for violating a restraining order barring him from approaching the Temple Mount. Morris had attempted to ascend the Temple Mount ahead of the Passover holiday in order to offer a Korban Pesach ritual sacrifice. Jerusalem's Old City, where the Temple Mount is located, was virtually empty on Sunday, as many stayed away due to the concerns of terror attacks targeting the area during the Passover holiday. Just last Monday a bus bombing took place in southeast Jerusalem, marking the first such bombing in the current Arab terror wave that has claimed the lives of 34 victims since last September.